All CES/LETS Systems tend to share some basic economic, social equity and community-building objectives. Trading with energy, rather than $$, recognises the valuable contributions of all individuals and creates greater local control over finances and economic affairs. Trading therefore helps to build up social and financial resilience against the unstable and unpredictable global economy. Energy exchange systems also seek to empower people to demonstrate their worth through valued activity. Along the way, many other benefits can evolve, such as better social contact and stronger social networks , psychological well-being, health care, tuition and training, support for local enterprise and new businesses. 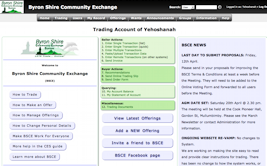 The CES trading system can therefore be seen as a way to develop a better community, rather than just a way to gain more, for less, for individuals.The more that members interact with each other, such as during trading days and gatherings, the stronger the community becomes, as well as increasing the likelihood of trading between members. CES is also compatible with the idea of Asset-based community development (ABCD), a movement that seeks to uncover and utilise the strengths within communities. The idea is that everyone has something of value to contribute to the community, and the community benefits from the non-material ‘assets’ of all its members. There are numerous alternative currency, barter and exchange programs in use around the world. Systems seem to be currently expanding rapidly in Spain and Greece. In 2001 when the Argentinean economy went into meltdown each province produced its own currency. The ‘ Global Exchange Network’, played a major role for many people in surviving the economic, social and political changes in the country. More information on the Argentine Network and its’ founding principles can be found at Alternative Currencies in Argentina.